I am a great fan of Chef Jacob. Whenever I find time, I used to watch Chef Jacob‘s show in Sun Tv. In one of his shows, he made Rice Omellete with left-over rice dishes. I was just surprised when he said Rice Omelette. I was wondering how could one make Omellette with boiled rice? When I saw how he made, I wanted to try it out that night itself. It was similar to the regular omelette we make. I simply like it, and may of my readers who tried this recipe said that it came out very well. I should only thank Late Chef Jacob for sharing this tasty omelette. 1. In a bowl, put boiled rice, green chillies, eggs, coriander leaves, salt, and white pepper powder. Beat well. 2. Heat a griddle or dosa pan. Pour the egg-rice mixture on the pan, and add 1/2 teaspoon of oil on the corners of the omelette. Once the omelette is cooked on one side, flip it over and cook on the other side too. Do not use oil more than required because eggs will not absorb oil like how fish or chicken does. Now, Rice Omelette is ready! Serve hot. This entry was posted in Egg on November 20, 2014 by vikashbhardwaz. A simple and healthy omelette! GYM Omelette is mainly for people who are health conscious and particular about reducing their weight.This omelette serves the purpose as it has broccoli and celery which helps a lot in weight loss. Make sure you add only egg whites for this omelette. Egg whites should be beaten well.I am not very particular about weight so I used egg yolks as well. Well beaten egg whites – 4 nos. If you want you could use the yolk also. 1. In a large mixing bowl, add all the ingredients except oil. Stir well. 2. Heat the pan and using a ladle, spread the omelette. Apply few drops of oil on the corners of the omelette. 3. When one side of the omelette has cooked, flip it over and cook the other side also. You can also use the egg yolks. If you are on diet and particular about weight loss, then use only the egg whites. A delicious and soft evening snack! When I was watching Chef Jacob’s show, he was describing how to make Egg Paniyaram. Immediately, lot of questions popped into my mind. What paniyaram with eggs? Would the smell of eggs be strong? Egg Paniyaram with just coriander leaves? how is it possible? I knew Chef Jacob can never go wrong! Still, I wanted to try it out. I had eggs and sufficient coriander leaves. What more do I need? It just took me very few minutes. Voila…Egg Paniyaram is ready!!! My heaven!!! It was too soft and kind of spongy. It tasted yummy. You can never have enough of them. It was yummy because of the right blend of eggs and coriander leaves. I make Egg Paniyaram often at home, and my family likes it. 1. Beat eggs well. Add chopped coriander leaves to the eggs. 2. Add the egg mixture to the dosa batter and put salt. Mix well. 3. In the paniyaram pan, heat oil. Oil should fill half of each slot in the paniyaram pan. Now, pour the dosa batter to each of the slots in the pan. Let it boil for 2 minutes. Turn them over. Now, Egg Paniyaram is ready!!! A healthy and tasty lunchbox recipe! I have always made sambar and poriyal using broad beans. I learned this recipe from Actress Viji and tried it out at home. It turned out to be a blockbuster hit in my family. It is definitely a lunchbox recipe. I am not a very big fan of coriander seeds but in this recipe, I liked the crunchiness of coriander seeds the most. When you eat this Broad Beans Pack, in between you get a crunchiness when you bite coriander seeds. So, just try out this tasty Broad Beans Pack and enjoy its crunchiness. Chopped green chillies – 2 nos. 1. In a large bowl, add all the ingredients under Chappathi and knead it well. Keep it aside for 20 minutes. 2. Make small balls out of the Chappathi dough. Then, in a hard surface, roll out the Chappathi into a round and flat Chappathi. 3. In a pan, put Chappathi and heat till you see small brown spots on the Chappathi. Flip it over and heat on the other side also. Chappathi is ready! 1. In a pan, heat oil. Add mustard seeds and wait till it pops out. Then, add curry leaves, onion, and green chillies. Fry until onions become transparent. Now, add coriander seeds, broad beans, and salt. Fry for few minutes until broad beans becomes soft. 2. Add turmeric powder and chilli powder and fry for 2 minutes. Add 1/4 cup of water. Sprinkle coriander leaves. Close the pan using a lid. Now the stuffing is ready. 3. Beat the eggs in a bowl. Add little salt. Now, dip the Chappathi in the beaten eggs and then fry it in a pan. 4. Place the broad beans masala in the middle of the Chappathi and first roll its corners. Then, roll the Chappathi sides inwards. Now, Broad Beans Packs is ready!!! Serve. You do not need a sidedish for this recipe. 1. In a bowl, put eggs, milk, and sugar and whisk well. Beat it well till sugar dissolves. Now, dip the bread slices in the milk mixture. 2. Soak the bread slices well. Toast the bread in a dosa pan. Drop oil on the corners of the bread. Cook the bread on both sides. Now, the Bombay Toast is ready! Serving Suggestions. Sprinkle ghee or sprinkle little sugar on top. We are a big fan of Avocados. When we visit any Mexican restaurant, our first preference would be to order Guacamole along with any other dishes that has avocados in it. Even when I buy Avocados for home, Guacamole would be my first choice. Last time, Gj had bought plenty of avocados and all were ripen at the same time. One day, I made Guacamole, next day I made Avocado milkshake, the day after next I madeAvocado chappathi and then I had two more avocados left. I wanted to try out something different. 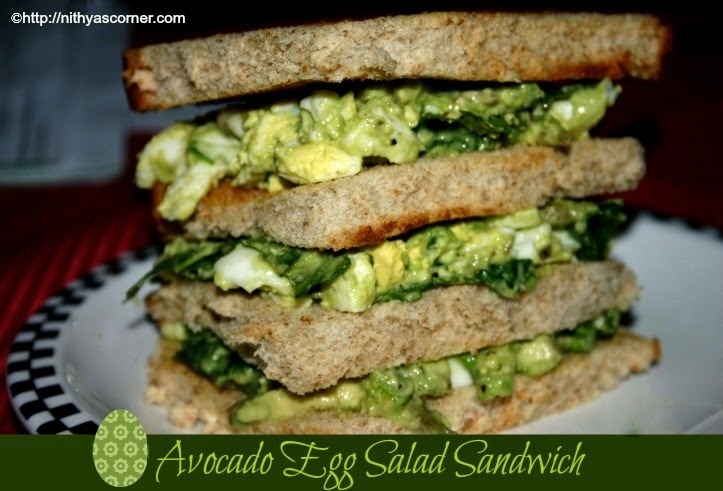 When I looked for Avocado recipes, I bumped upon this Avocado Egg Salad Sandwich on Cookingandme website. I loved the pictures. I had all the ingredients at home. Then, what is the need to wait? I tried it out and it came out very well. First time when I made this recipe, I used all the ingredients listed in the recipe. It came out very well. Another time, I made the same recipe omitting boiled eggs, avocados, coriander leaves, and spring onions (I actually forgot to boil the eggs…). Again, this combo also came out very well. This recipe can be adapted to your taste. Try it out and you will know! Greens like watercress leaves, baby spinach etc. – a small bunch. I used salad spinach. Ripe avocado – 2 nos. 1. Wash and chop the salad spinach. Crumble the boiled eggs with a fork. In a mixing bowl, add the avocado flesh, chopped salad spinach, crumbled eggs, coriander leaves, spring onions, salt, pepper, and any salad dressing. Mix well. Finally, add lemon juice. Mix again. 2. You may toast the bread and spread butter on one side of the bread. This is optional. Then, apply the avocado spread on top of the toasted bread and place another toasted bread on it. 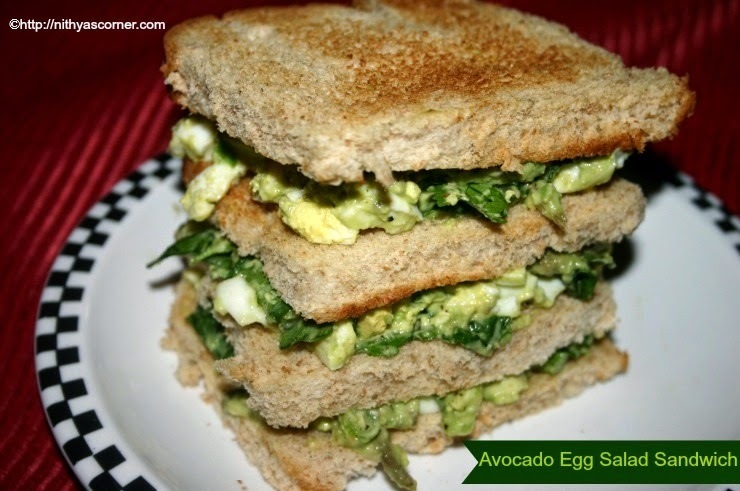 Now, Avocado Egg Salad Sandwich is ready! This entry was posted in APPETIZERS | STARTERS | SNACKS, Egg on November 20, 2014 by vikashbhardwaz.